Now that spring is back and warm weather is here to stay, it’s time to start thinking about how to switch over from heating your home to cooling it down in stylish, energy-saving ways. Since windows are to blame for a large portion of home energy loss, spring is the perfect time to spruce up your home with some new window treatments. By investing in the right design trends, you’ll get all the functionality needed to cool down your place during the hot months, plus the bonus of having a fresh new look that will bring a smile to your face and compliments from all your friends and neighbours. Technology has become an integrated part of our daily lives, so it shouldn’t come as a big surprise that even home decorations are starting to become digitized. Companies like Elite Window Fashions now offer products such as Elite Smart Shades, which can be operated with remote controls and smartphones to save you energy in an automated way. 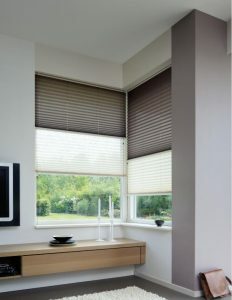 Get them in different styles, for instance as cellular shades or roller shades. If used with Elite’s sun sensor and mobile app, you’ll be able to set this high-tech window treatment to operate itself in relation to however much sun and heat it senses. Even without the sun sensor, by just using the mobile app, you’ll be able to automate the shades based on timers set for your convenience. Thanks to increased public awareness regarding the health of our planet and our own well-being, the availability of eco-friendly products has skyrocketed in the last few years. This is not just limited to the organic foods aisle in your local grocery store. Commercial window coverings now come in a range of high-quality materials that are safe for the planet, and safe for your home. Elite Window Fashions has many products featuring fabrics that have been certified as environmentally friendly by third party organizations, including Greenguard and the Canada Green Building Council. This means that fabrics contain labelled with these certifications contain no volatile organic compounds (VOCs), which are a large contributor to urban pollution. Accredited products are also free of dangerous chemicals and smells. Many homes feature window blinds with long, unruly cords that unfortunately pose a choking hazard to children as old as eight-years-old. Sadly, accidental death by strangulation is not uncommon, because unsuspecting children sometimes get caught in the cords, even when adults are only a room away. These ‘silent killers’ have led to the passing of new consumer regulations by Health Canada, requiring all corded window treatments to come with cord/chain tension devices. If you’re looking to upgrade your window treatments to save on energy expenses anyway, you might as well invest in a cordless option like automated window coverings. 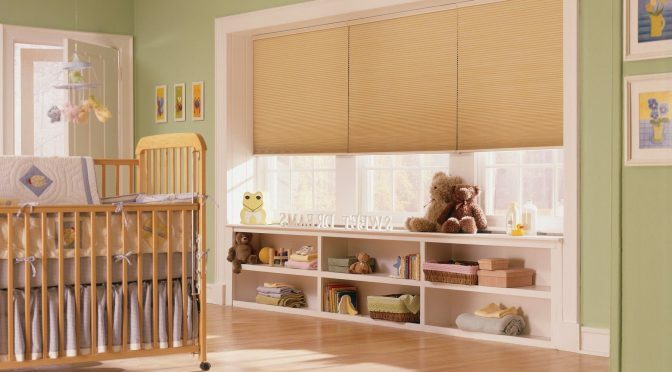 If a cordless option is too much of an investment, roman shades with a continuous cord loop are a good corded option, as the cord can be easily fastened to a window for child-proofing purposes. 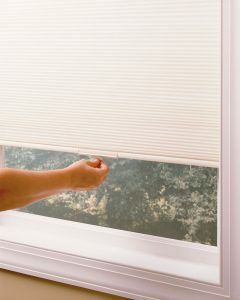 Otherwise, cellular shades are very popular because they come in a variety of options, whether they are motorized, manual but cordless, or feature a continuous cord loop. Whatever option you choose, if you’re in the market for new energy-saving window treatments, be sure to keep your child’s safety in mind first. If you’re the type of person who loves a scenic view, but are still committed to reducing your home energy costs, a motorized solar shade might be just the thing for you. Solar shades are designed for those of you who still want to be able to look outside without being blinded by the glare of the sun. Elite Window Fashions offers four fabric types to suit a range of budgets and applications. High Performance fabrics like the SilverScreen, the EnviroScreen and the E Screen with KoolBlack Technology are all great solar shade options featuring PVC, which is flame retardant, and they can reflect a significant amount of heat from the sun, which means your windows are kept cool and stylish all summer long. No matter what your home needs this spring or summer, Elite Window Fashions has an option for you. From classic vertical blinds to the most high-tech automated window coverings, there is something for every budget and taste in mind. With the right choice, you can keep the energy costs down and the cool factor up!